Summer of Words: By the Butterfly Tree – Part Seven | Phil – Refuelled! With this part, my story enters a new phase… but you can start at the very beginning here. It was a warm sunny Sunday afternoon in August. There had been no serious raids for a while, now. After their mid-day meal, Archie suggested to Jenny that they might go for a walk. However, Jenny pointed out that, with some birthdays not far away, she had some knitting to finish. As Archie did this, he tried, out of kindness, not to seem too enthusiastic. But in fact, this was what he had hoped for. He needed to clear his head, in every sense. So, with Jenny safely ensconced in her favourite chair, he grabbed his small ’emergency’ rucksack, and set off. Almost subconsciously, his walking route took him closer to Trafalgar Terrace. He felt it keenly that, that March night, fire had beaten him. Somehow, he felt he had to go back and look, to clear his mind about this, even though he couldn’t explain why. As he reached the terrace, he could see that it was completely derelict; this was no surprise. The usual warning signs had been put up. Archie took his tin hat from his rucksack as he approached the end house. Number fifteen. You could still read the painted figures on the brickwork, close to the boarded-up front door. Putting on his hat, he walked through the alley to the back. The back door, of course, was boarded up too. A low wall enclosed a tiny yard. He glanced absently about him and entered the yard, randomly kicking small pieces of rubble. Then, quite by chance, he noticed, just protruding from under a few bricks, what looked like a leather belt or strap. Bending down, he pulled it gently. His grip met with resistance, so he stopped to lift away some of the rubble. This uncovered a small, well-used, and now very battered, leather satchel such as a school-child might have used. And then, Archie’s heart thumped as he remembered: on that terrible night, he’d caught his foot in something, then kicked it free as he emerged from the back door. This had to be what had almost stumbled him! Undoing its two buckles, he looked inside for a moment. It appeared to contain some personal papers and letters. Oh well, he’d take it home, and drop it in at the police station tomorrow. With one last glance around, he headed homewards. Back home, he was glad to find Jenny in good spirits, having enjoyed her knitting session. Putting the kettle on to make tea for them both, Archie told Jenny about his find, and how it would mean a trip to the police station nearby. Jenny then ventured that she could do that herself, the next day. Part eight is now published here. Just catching up with this. Oh the twins… I had a tear in my eye for them. What I love most about your writing is the description which is added through Archie’s dialouge with himself – i.e. ‘Archie grinned as he reflected that, had he been a gambling man, the very last thing he’d have bet on was the chance of Charlie finishing up as a police officer.’ There’s lots of that and it really adds to the colour and life of the story. I wonder what twist is going to result of this satchel… The genre of this tale very much suits me as a reader – set in the past with intrigue and a real warmth. Look forward to reading more. You have encouraged me to keep going! Sorry not to reply before. Section three (parts 13 – 18) is my next challenge! 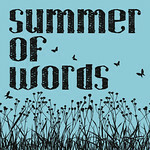 I was late to the Summer of Words party too Phil, the linky was closed by the time I finished ha! I ended up putting it as a page on my blog, but hey, better late than never.